It is recommended to buy a better one. Choose system, depends on your budget. FrSky X9P plus with X8R is tested, but a high budget system. RC receiver must have PPM, S.BUS or spektrum satellit output. 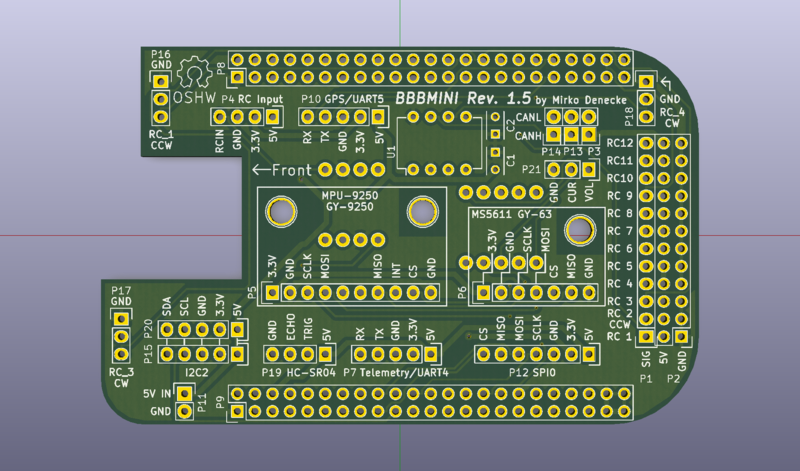 BBBmini is an autopilot / flightcontroller Cape for the BeagleBone Green. BBBmini + BeagleBone Green can be used as a state of the art Linux autopilot / flightcontroller for Copter, Planes or Rovers. BBBmini can be used with ArduPilot (open source unmanned aerial vehicle flight stack. BBBmini is a DIY project using widely available IMU and barometer breakout sensor boards, there is no SMD soldering necessary. The design is made that everybody can build a BBBmini by himself. In flight internet connection is done via WiFi link. BBBmini uses ArduPilot as flight stack. I contribute patches to the ArduPilot that BBBmini is supported by ArduPilot software. Plug USB telemetry radio into your host PC. I recommend to use APM Planner ground control station for beginners. Advanced user can use MAVProxy ground control station. Change 192.168.178.25 to our host computer IP address. BBBmini by Mirko Denecke is licensed under a Creative Commons Attribution-ShareAlike 4.0 International License. UNLESS OTHERWISE MUTUALLY AGREED TO BY THE PARTIES IN WRITING, LICENSOR OFFERS THE WORK AS-IS AND MAKES NO REPRESENTATIONS OR WARRANTIES OF ANY KIND CONCERNING THE WORK, EXPRESS, IMPLIED, STATUTORY OR OTHERWISE, INCLUDING, WITHOUT LIMITATION, WARRANTIES OF TITLE, MERCHANTABILITY, FITNESS FOR A PARTICULAR PURPOSE, NONINFRINGEMENT, OR THE ABSENCE OF LATENT OR OTHER DEFECTS, ACCURACY, OR THE PRESENCE OF ABSENCE OF ERRORS, WHETHER OR NOT DISCOVERABLE. SOME JURISDICTIONS DO NOT ALLOW THE EXCLUSION OF IMPLIED WARRANTIES, SO SUCH EXCLUSION MAY NOT APPLY TO YOU. EXCEPT TO THE EXTENT REQUIRED BY APPLICABLE LAW, IN NO EVENT WILL LICENSOR BE LIABLE TO YOU ON ANY LEGAL THEORY FOR ANY SPECIAL, INCIDENTAL, CONSEQUENTIAL, PUNITIVE OR EXEMPLARY DAMAGES ARISING OUT OF THIS LICENSE OR THE USE OF THE WORK, EVEN IF LICENSOR HAS BEEN ADVISED OF THE POSSIBILITY OF SUCH DAMAGES. 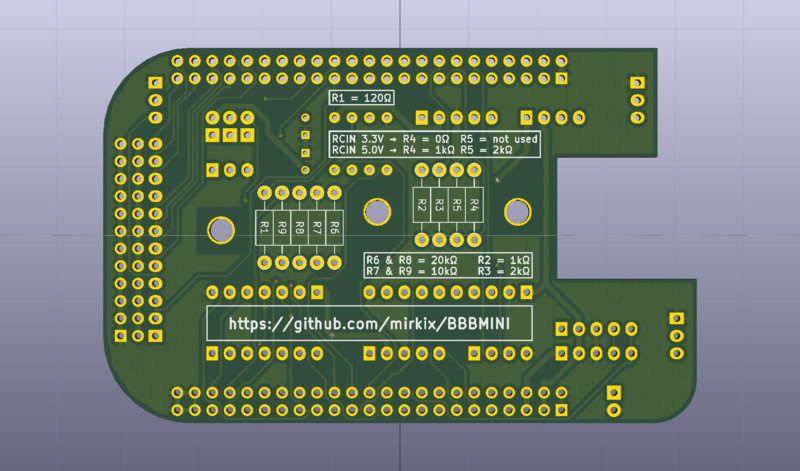 This link provide all Kicad source files for the BBBmini it also provides GERBER files which could be send to a PCB manufacturer. This is the firmware I have written in assembly for a PRU. It generates 12 channel PWM signals with better than 1us accuracy and variable frequency for each channel. It also can read S.BUS, PPM SUM or spektrum satellite signals with 5ns accuracy. // Set pin or clear pin? This ist the firmware I have written for a PRU in C. It is a hardhware driver for a HC-SR04 ultrasonic rangefinder. Small tool I have written to load, start, stop PRUs from Linux command line.